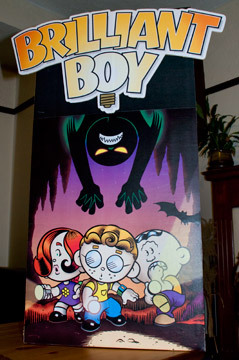 When we first developed the Brilliant Boy concept in the mid-1990s, the easiest way to distribute an idea was on paper. Fast forward to 2009 and technology now allows us to digitally publish an idea to a potentially global audience. The world has changed. But some things will always stay the same, like our love for comic book art and story-telling. So it is with great pleasure that we are relaunching the Brilliant Boy website, and with it a Brilliant Boy comic strip. There will be a new strip every Monday, Wednesday and Friday, and it will follow Brilliant Boy, Bookman, Stymie and Poetica on their daily escapades in small-town Baskerville. We hope you enjoy. We welcome any comments on the comic or the website. We will do our best to reply. Thanks for reading. 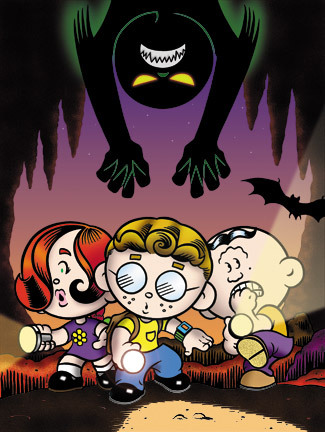 I like to share with you a promotional illustration we did for Brilliant Boy when we were still self-publishing our comic books. It captures the essence of the “Drake” storyline (BB#2-6), a vampire tale inspired by Bram Stoker’s Dracula. I still like the illustration for I think it shows everything that I want Brilliant Boy to be: adventure, mystery, excitement and fun. In fact, we still use the image today to promote our comics at book fairs, as seen in this photo of a home-made point-of-sales display.